Qualcomm’s mmWave Antenna Modules consist of 5G NR millimeter wave (QTM052) and sub-6 GHz RF (QPM56xx) models. The units are designed for smartphones and mobile devices. QTM052 supports up to 800 MHz of bandwidth in the 26.5-29.5 GHz, 27.5-28.35 GHz and 37-40 GHz mmWave bands. QPM56xx family consists of QPM5650, QPM5651, QDM5650, and QDM5652 models. The sub-6 GHz RF modules provide integrated SRS switching and are suitable for MIMO applications. 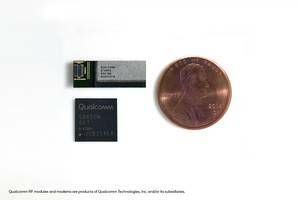 SAN DIEGO, July 23, 2018 /PRNewswire/ -- Qualcomm Technologies, Inc., a subsidiary of Qualcomm Incorporated (NASDAQ: QCOM), today unveiled the world's first fully-integrated 5G NR millimeter wave (mmWave) and sub-6 GHz RF modules for smartphones and other mobile devices. The Qualcomm® QTM052 mmWave antenna module family and the Qualcomm® QPM56xx sub-6 GHz RF module family pair with the Qualcomm® Snapdragon™ X50 5G modem to deliver modem-to-antenna capabilities across several spectrum bands, in a very compact footprint that is suited for integration in mobile devices. Qualcomm QTM052 mmWave antenna module family, Qualcomm QPM56xx sub-6 GHz RF module family and Qualcomm Snapdragon are products of Qualcomm Technologies, Inc. and/or its subsidiaries.